The David R. and Susan S. Goode Railwalk extends from Market Street to Warehouse Row, allowing pedestrians to walk along a fence paralleling the train tracks and view historic memorabilia along the way. The Railwalk tells the story about Roanoke’s rail history, both visually and audibly: There's a platform, signals, whistles, plaques and storyboards with information about the events that formed this history. There's even a radio scanner at one point that allows listeners to hear chatter from engineers and dispatchers. The Railwalk was named after David R. Goode, who was president, chairman and CEO of Norfolk Southern Corp. until 2006 when he retired. 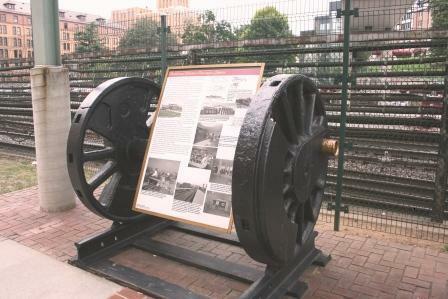 During Goode's tenure, Norfolk Southern donated a number of artifacts from the old Farmville line for use in the railwalk. He also helped deliver to Roanoke the historic 1218 locomotive, which is stored in the transportation museum. The city honored the Goodes for their strong support of Roanoke's rail history. Rail Traffic: Expect around 40 trains during a 24-hour period. Site Details: A 1/3-mile longated along the active Norfolk Southern (former Norfolk & Western) mainline. Park benches and a parking lot provide rest between trains. The Railway connects to Hotel Roanoke and the Virginia Museum of Transportation, an excellent railroad museum with lots of locomotives and train cars displayed, mostly outdoors! The museum is located next to the NS mainline and is at the east end of Roanoke Yard. Restrooms on site: Public Restrooms can be found within walking distance of the Railwalk. Food: Historic Roanoke City Market, located a block south of the Railwalk offers several restaurants, and a coffee house. Additionally, Hotel Roanoke has a fine restaurant, and gift shop that sells snacks and soft drinks / water. Picnic Area: Just picnic benches located on the Railwalk. Parking: Free parking is limited in Roanoke, but several parking lots offer pay-parking. 160.440 - NS (ex N&W) Channel 3-Road. Motels / Hotels: Hotel Roanoke (a DoubleTree Hotel property) is located on the Railwalk and is the ideal place for railfan's to stay while in Roanoke. Ask for room overlooking the railroad! 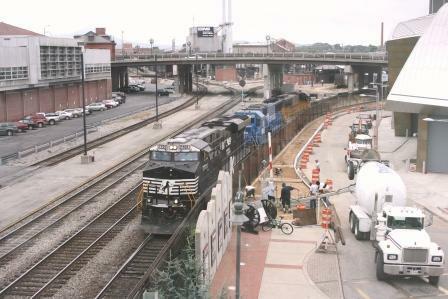 A westbound train is about to pass under the enclosed pedestrian overpass that connects Hotel Roanoke with the Railwalk, and the rest of downtown. Due to reflections off the glass windows, photography is not the best from this vantage point, but it can still make for a nice shot. The old N&W Roanoke train station can be seen to the left side of the photo, it's now the O Winston Link Museum, a must visit for any railfan visiting Roanoke. 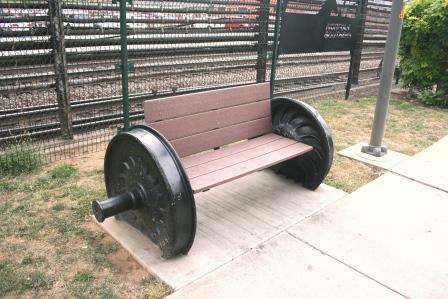 One of many benches located along the Railwalk - everything here has a railroad theme! A steam locomotive driver spends its retirement holding up a history plaque. Wouldn't we all wish it was holding up the steamer that it was manufactured to hold instead!